The Signal Hill Tattoo begins with the march of the Grenadier Company of the Royal Newfoundland Regiment of Foot onto the field. Striking in their white breeches, red waistcoats, black bear-skin caps, and flint-lock muskets, the Grenadiers practice their war-time maneouvers at the command of their Infantry Officer. The audience sees the movements before their eyes, and with the help of an on-site commentator, understands the use and purpose of each and every movement. After a performance by the drums, the Grenadiers practice for the theatre of war. Watch in awe as the infantrymen fend off an enemy attack with round after round of musket fire, with support from the artillery and its cannon and mortars! Once the show ends, the infantrymen will greet the tourists and you will have the opportunity to have your photo taken next to a soldier from the 18th century! 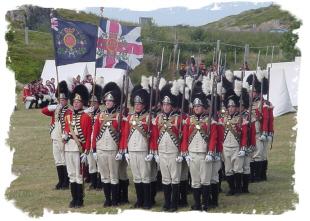 The Grenadiers perform in the Signal Hill Tattoo every Wednesday, Thursday, Saturday, and Sunday at 11:00am and 3:00pm at the Signal Hill National Historic Site from July to August. Click here for directions to the show, and click here to learn all about the Grenadier Company and its history.